The shuttle down to the surface of Korriban was utilitarian, the sort of antiseptic cleanness so familiar in the designs of the Imperial Navy dominated. This wasn’t a VIP transport, but it was sufficiently comfortable for a group of new Initiates. You had all arrived at the orbital station via your various transports, but from there you had been escorted by Imperial troopers to a shuttle to the surface. 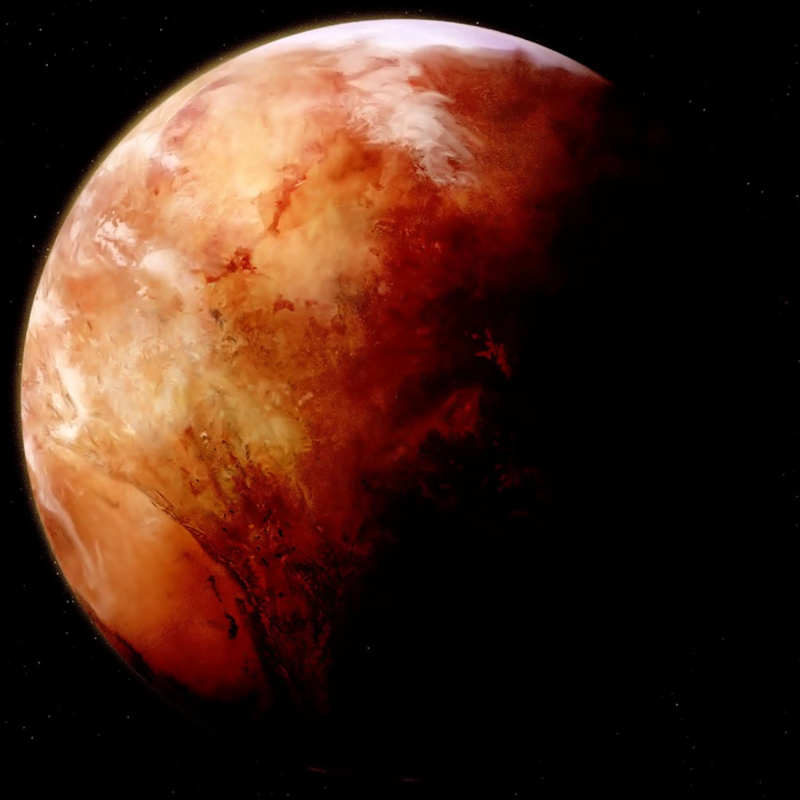 The Empire tightly controlled who was and was not permitted to land on the surface of the planet, it was a veritable holy world for the Sith Order after all. As you look around you can see that there are ten Initiates in the shuttle’s cabin. It is a motley mixture of humans and aliens. Each of you has been provided with basic equipment, robes and training blades. The blades were very much unlike the lightsabers of the Sith, though the rods of durasteel were closer to vibroswords than lightsabers. The troopers had been cooly polite to the non-humans among the group, clearly whatever the Empire might preach about human superiority, they weren’t taking the chance of insulting someone who might one day be Sith. The shuttle lands with the sort of perfect drilled efficiency you might expect from the fleet personnel who’re assigned to Korriban, and you disembark onto the platform, one of several that served the Academy. The door opens with a hiss and the boarding ramp lowers. Outside the air is warm and dry, and when you breath in, you can feel the ancient power of the place as omnipresent as the dust that seems to hang in the air. Once you reach the bottom of the board ramp, you find waiting for you a Pureblood Sith in the robes of an Overseer. He looks over you with a disinterested detachments, like a merchant inspecting a particular boring shipment of goods, and then speaks. He has the crisp, clipped accent of one raised in the Empire’s upper-classes, and his tone is somewhere between bored and dismissive, every inch the haughty aristocrat. “Greetings Initiates, my name is Overseer Amdis. I will be in charge of your trials. Make no mistake, as far as I am concerned you are less than nothing, it is an unfortunate sign of the times that the Academy has lowered its standards such that things like you are permitted to step forth on this hallowed ground. Nevertheless, I am obliged to provide you a chance to prove your worth or die trying. I imagine for most of you it will be the latter.” He doesn’t quite laugh, but for a moment you can hear the trances of amusement in his voice at that last remark. However, it is gone as quickly as it appeared and the Overseer continues. “If you somehow manage to survive, your future will be determined by how well you perform. If you wish to become Sith you must be elevated by a Lord. That means you will need to prove that you can be of use to your betters, and secure an apprenticeship to a current Lord. While I very much doubt any Lord of the Sith would sully themselves with the likes of you, the Trials are always closely watched by those looking for apprentices, so I suggest you keep that fact in mind. He look over the group to see if there are any questions, though clearly not wishing to hear any. Body of the post, including fluff, etc. A one or two sentence description of your action including which qualities[+2] you want to apply. The shuttle ride was smooth, even if the transport was spartan in its accommodations. It was staffed by the imperial navy, the marines on board relieved that their mission could be handed off to the army. Squads of imperial troopers escorted you and other hopefuls along with the hopeless to their fate in the citadel of Sith might. The security was layered without seeming to impact the academy and its rulers. Gear was delivered to each of you by the imperials as your old items and clothing was removed. 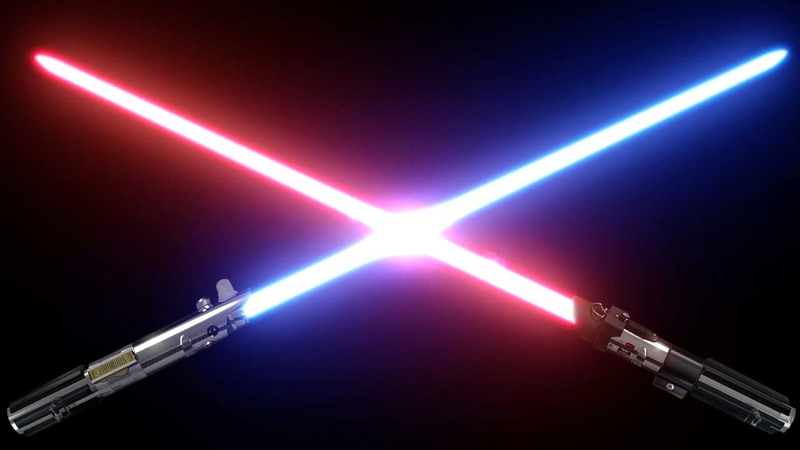 Training weapons, deadly but not as strong as a light saber were given to each of you along with initiate robes. As you exit the ramp of the shuttle, you see another parked nearby. As you make your way to the new arrivals area the wind blows hot. The initiate was then thrown to the ground with the force. The thrown Zabrek groaned after being smashed and took his place back in line submissively. The overseer took in your arrival and sighed. In a raspy voice he began, “Listen up. All of you. I am overseer Talco. I care not who you were or what you are because now you are nothing. I will oversee your trials and either see you succeed, or watch you perish to be forgotten and unremembered where you fell. *If* you succeed you will have the honor of becoming Sith. The lords will be watching your progress and should you succeed then they may reward you with that honor.” He looks over all of you. Some look frightened, some smug, a few determined. “Your first task, is to go into the tomb of Marka Ragnos and retrieve recently uncovered writings detailing the dark histories of his time. The tomb is littered with deadly traps, beasts, and potentially a few disgraced initiates. Return with the writings or not at all.” He spat hatefully. “Those of you that live will earn a sliver of my respect and might just be worth my time. When you have the writings, return to me at the academy in the eastern wing. Now get out of my sight before my rage over takes my sense of duty!” With that the overseer stalks away, other initiates scattering before him. 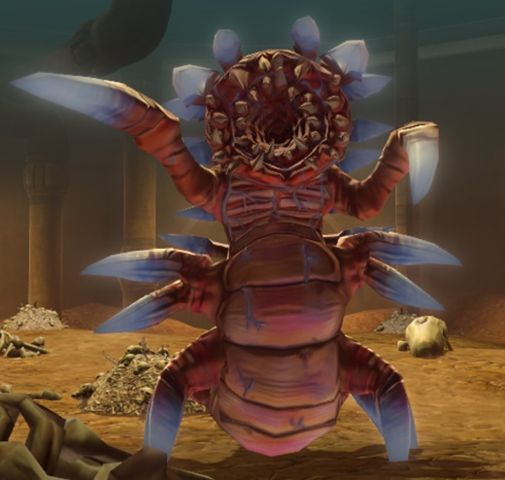 The Zabrak who suffered Overseer Talco's ire scowled at the rest of you. “What are you all looking at? Anyone of you crosses me, will have an accident.” He shoved his way through some of the other initiates as he left. A small woman initiate walked to a few of the others. She would ask something but they'd shake their heads before hurrying away. As she approached the last four of you she begins to panic. “I can't! I won't make it! 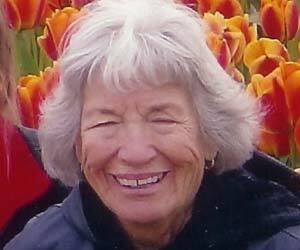 Please help me, we can work together.” Her weakness and fear can be felt by each of you. She doesn't control her fear but it controls her. The task looms before you as well as choices. Kier said nothing in response to the pureblood overseer's words. Misery. Pain. Death. It was the way of the darkside. Checking his weapon worked, he switched it off and stowed it on his back. He began to walk towards the tomb, ready for anything. If others joined him, it would be their prerogative. 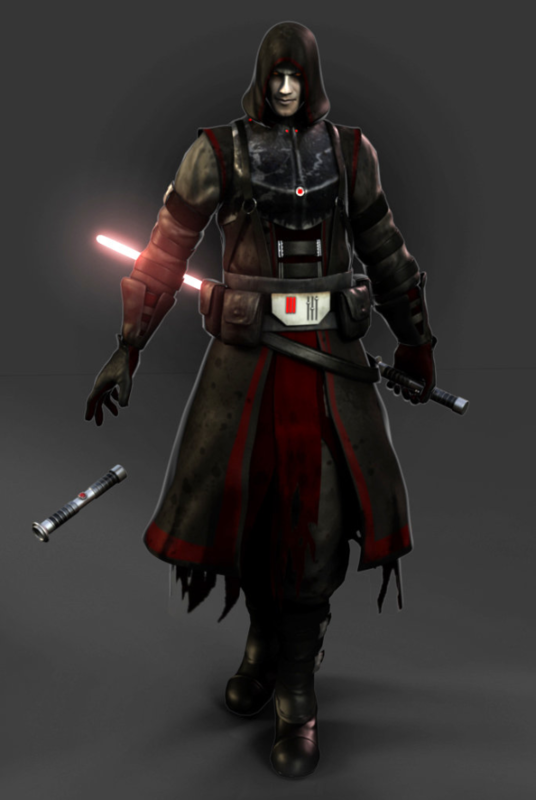 He could see many initiates speaking with imperials, other sith task masters, carrying scanners and rushing on errands. He would find Spindral and either die permenantly (and blessedly) or succeed and go where the force willed. Going with the flow, for now. Force Specialty: Power of Hatred [+2] - Keir's hatred fuels the dark side within him so much that he can sustain massive amounts of damage and still live (since the Force is life). Mortal, Incapacitated or Death blows dealt to him are treated as mere wounds. Whenever Keir uses this ability, all damage is removed from him, even though the wound is still there, but is no longer treated as an injury. This effect can be negated if his will is broken. More detailed explanation: Obviously whether it is a force-barrier or armor based thing or the aforementioned ability, it is a tanking Jug style stat. The flavor being this hate fueled healing. It is not immortality or invincibility. "Coming back" Michael Meyer style may not be timely nor accomplish the goal, but could make for some dramatic reappearances. Force Drawback: Pain [-2] - Peace is a lie and Pain is eternal. Every bone broken, every wrong done to him all as fresh as the day it was visited upon his body and mind. It fuels him, it torments him. It can distract or derail him. The more he grows in power, the more he must seek clarity. For if he loses sanity, he will be no more than the wounded force-spawn beasts. As the initiates disembarked from the shuttle, Lom had done his best to ensure he was at the front of the group. He didn't want to miss the opportunity to make a good first impression, if the opportunity presented itself. 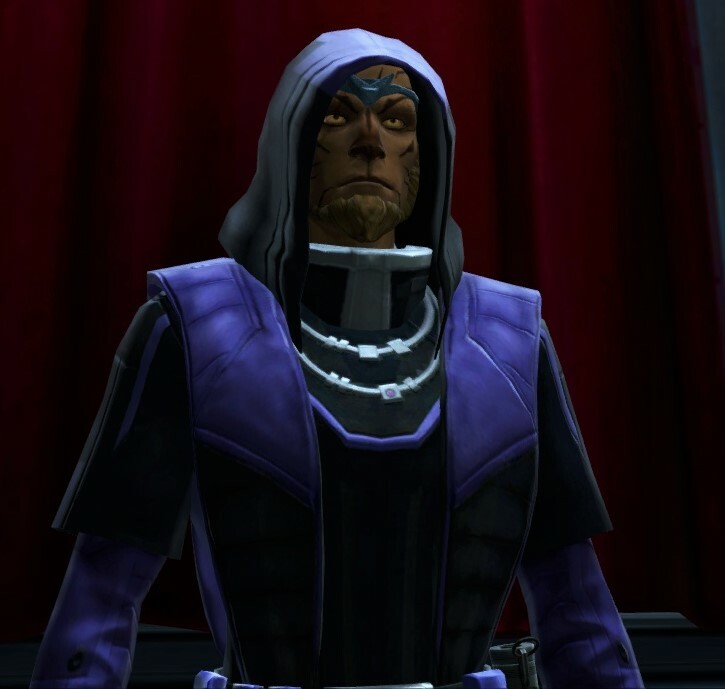 He very quickly realised there wouldn't be any opportunity here - he had encountered enough of the Overseer's type on Dromund Kaas - the type who expected their subordinates not to speak unless spoken to. Lom doubted any response the Overseer gave would be of any help, either. Best to get on with the task at hand; Overseer Amdis expected results, and Lom would deliver them. Falling in next to another initiate heading to the tomb, he clears his throat. "I'm not sure what we'll find in that tomb but I'll bet it'll go easier for us if we work together. What do you say?" 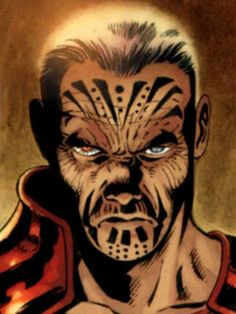 Specifically speaking to Felsto but if anyone else wants to interject that's ok.
was shipped off to Korriban to begin his initation and further the family name. controlling his twin sabers, keeping his enemies at a distance. into their minds for even the most basic of mind tricks. So many humans. Three had been on Kolzaar's transport. One was overseeing his platoon of initiates. Now another was begging for help in front of him. Kolzaar brushed his robes with his wings, they were not the most impressive armor. But Kolzaar reasoned that they were traditional; and anyway, no one had come here to be blanketed in safety. Kolzaar loomed over the diminutive human. To her credit though, she did not seem afraid of him. Only of her circumstance. She cried and pleaded "I'll never make it! Please, we can work together!" Kolzaar hummed and tutted, narrowing his eyes on the young woman. He blinked slowly, like a raptor, and began to swipe at his utility belt with his wings. After a moment's struggle, his training saber fell to the dirt ground beneath him. "Carry my weapon for me." He said, disinterestedly. The woman looked shocked but quickly fell to the ground and clutched the training blade, an expression of tremendous relief on her face. "With a second claw perhaps you'll whimper less loudly." Without another word Kolzaar began to march toward the catacombs. He listened carefully but heard no scurrying behind him. Over his shoulders he cawed "Come along little human!" In short order he heard the woman scurrying to match his tremendous strides. Heading into the catacombs to begin acquiring the writings. Kolzaar gives his training blade to the hysterical woman and instructs her to follow. Hopefully she'll be useful if she can duel weild. Species: Unknown (just another exotic race sold on the Black Market. Initially talented in this discipline, Kolzaar has advanced to a prodigy through diligent practise. His anatomy makes lightsabers unwieldy and, consequently, Force Barrier is often the only thing standing between him and a missing limb. It requires great nerve, daring and discipline to come so close to a lightsaber's blade and remain in complete control. 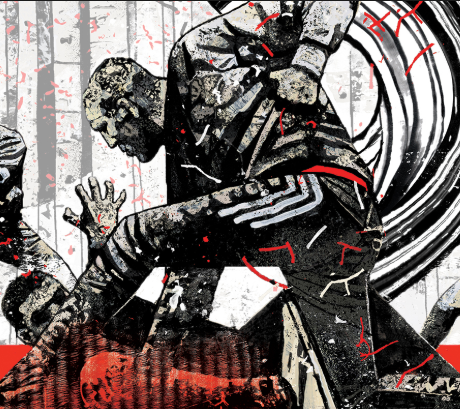 But this proficiency allows Kolzaar to employ a much more savage fighting style, comprised of brutal kicks and rough grapples at maddeningly close range. Kolzaar lags far behind the other initiates at the art of force healing. If something should penetrate his barrier, he would not be able to set the wound or numb the pain. Nor can he heal the wounds of others. Any and all injuries represent a long term handicap to Kolzaar's physical prowess. Therefore, he must fight cautiously. Ambition: Kolzaar aspires to usurp Dobo The Hutt. To bring war to all the Hutts. To capture their criminal empire and claim it for himself. He also wishes to find his planet and his people, so that they may join in the war and establish their place in the galaxy as lords of crime. Kier looked at his fellow initiate(Lom Trajak) in response and shrugged. "You can come if you want." He started walking again. "I'm Kier, if that matters." Bikke had kept quiet throughout the trip down, maintaining a studied silence throughout, one he still maintained even now. It was all a mask of course, underneath his emotions roiled. Fear, excitement, anger all blended into one another, and Bikke savored the power his emotions afforded him. As a slave he had been expected to be ever quiet and submissive, never to feel, now he could revel in not having to suppress his feelings, but rather to let them power him. Still, he understood that displaying his emotions could be dangerous, it was a lesson burned into him as a slave, and one he would exploit now. As the other initiate came before them begging for help, he merely ignored her and walked away towards the direction the Overseer had indicated. As he made his way to the temple, the Cathar took a few experimental swings of the practice sword. He had received some training from the Sith who had found him, but he had little doubt he would never be the master of the blade. Still, one never knew when a tool might be useful, and so he resolved to keep in practice just in case. The tomb would be upon him soon. He allowed fear of the painful death the trials promised, and the anger that burned inside at their so-called Overseer to draw forth the Dark Side of the Force. He would need it soon enough. Bikke's gonna ignore the woman and head for the Tomb. Background: Bikke was born a slave on a remote agricultural world. The Empire has never been kind to non-humans and he grew up working the fields his inferiority pounded into his bones. What his owner and overseers did not know was that he had been born powerful in the Force. When he was young he hid his powers away, even as he dreamed that he might one day be Sith, no longer a slave but a being with the galaxy at his beck and call. However, even those dreams were nearly crushed. For while Bikke has his talents, the use of the Force to move and control physical matter had never been one of them. When the Sith that came to the farm where he labored called forth each slave to test for Force ability, he disinterestedly called for a display of telekinetic power, Bikke failed just as badly as if he had no connection to the Force at all. Despite his pleas otherwise, the Sith clearly had no real interest in finding Sith among alien slaves, and he was sent back to the fields. All seemed lost for the young Cathar, but the Force works in mysterious ways. His talents had always lay with the manipulation of the life energies, and his experiments had resulted in some more noticeable improvements in some of his fellow slaves. The sort that could not be ignored. The fact that the Empire was offering a generous reward to any slave-owner who discovered force-sensitives certainly didn’t hurt his master’s decision to report him to the Sith. When another Sith was dispatched to investigate Bikke’s owner’s claims, they discovered that unlike previous reports he was indeed strong with the force. He was taken to from the only home he had ever known. 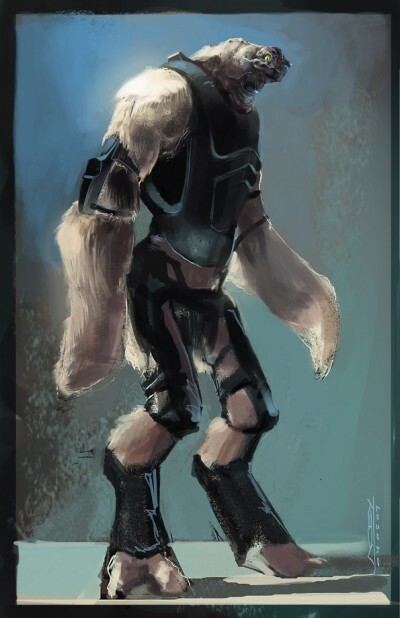 Like all potential Initiates he was trained in the use of his powers, and when the time was ripe sent to Korriban to sink or swim in those most treacherous waters. 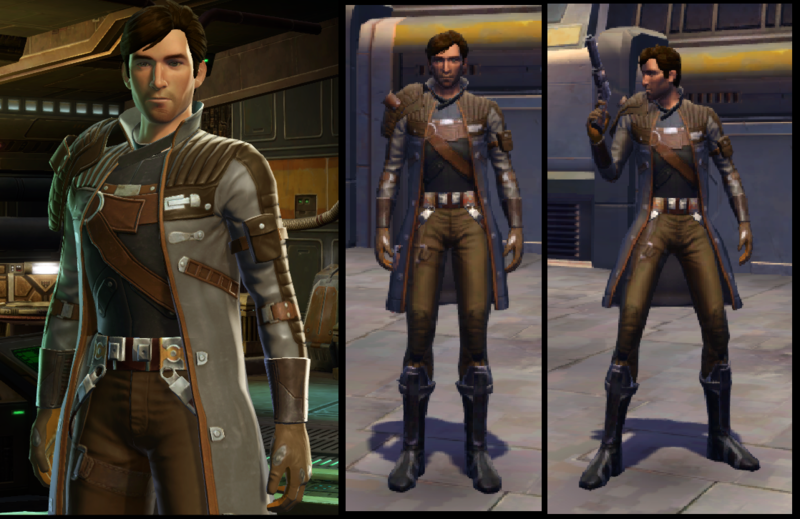 Force Specialty: Life Manipulation[+2] - While Bikke has all of the skills one might expect for an Initiate Inquisitor on the way up, there is always one area where he has truly shone. 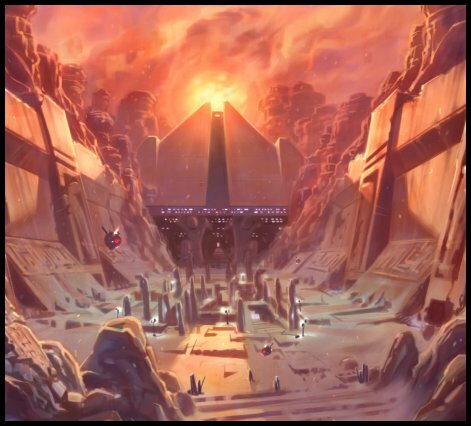 There is a long tradition of Sith Sorcery focused on the manipulation and alteration of the life-force of other beings dating back to the very schism that split the Jedi and lead the dark exiles on the path to found the Sith Order. It is in this field that Bikke is a natural prodigy. In battle, he can try to rip and tear the life-force from his foes (though at the moment he can more nibble at an opponent's life-force than eat it whole), but the true power of such a skill can only shine with time and concentration. Without the distraction and din of the battlefield a practitioner can attempt to shape lifeforms to suit his or her needs. Make a creature stronger, or endow it with venom or other useful traits. Bikke has always been a quick study of such things, and it was his alterations to the beasts he tended that caused his force potential to be noticed initially. Now a universe of knowledge filled with countless lifeforms and people to study and alter lays before him. Force Drawback: Incompetent Telekinetic[-2] - One of the most well known uses of the Force both Light and Dark is as a invisible hand. Jedi and Sith alike employ these skills for a variety of purposes from large to small, from clearing the dust off of one’s cloak to tossing boulders the size of a starfighter to crush an opponent. This signature skill just so happens to be one that Bikke has no talent for at all. With utmost concentration and after years of effort, Bikke can now with great effort lift objects about the size of a one-credit piece, something even Initiates half his age could do in their sleep. It was his complete lack of talent in this field that had him passed over when they had tested all of other slaves for force talent. The Sith in charge had tried to elicit a telekinetic display from each of the slaves, and as each failed to produce results they were sent back. Even now it is a source of shame and anger for him, one he is constantly seeking to overcome. Ambition: Bikke started life as an alien slave, the lowest of the low. Now, however, he stands on the precipice of becoming Sith. He has set his sights on the very top, he wants a seat on the Dark Council, he wants to be feared and respected and loved throughout the galaxy. He wants planets to rule, servants by the thousands sculpted by his powers to suit his needs and fancies. He wants to enjoy this new life, the one he had long dreamed about to the fullest, to indulge his desires and use them to grow even stronger in the Dark Side of the Force. In short, like any good Sith, he wants it all. Angry and violent overseers? Check. Zero instruction and a potentially fatal first task? Check. Zero oversight in performing that task? Check. It didn't take force visions to see how things would go here. The screaming woman was obviously weak but Kolzaar was very strong. With good eyes. Seeking the safety of numbers and the one least likely to stab him in the back at the first opportunity he followed along. The woman would likely turn on them once she started feeling herself again, but Zef would be ready. Going to follow along with Birdman and the Banshee. Desecrating the Tomb of Marka Ragnos. Background: As smuggler born in hyperspace Zef has never felt tied down to one system or another. His early life as a scoundrel was a string of successes until he began to attract more powerful attention. An encounter with some rogue jedi that required his services led to the discovery that his uncanny luck was due to his latent force abilities. After consideration, Zef decided that the Sith, while more dangerous, would be his best bet toward unlocking the rewards that such abilities might bring. Sith Inquisitor[+2] As a rogue Zef never was one for a fair fight. The longer one was exposed the longer someone had a chance to pick you off. Best just to be sneaky and underhanded and get them before they get you if a simple escape was not a viable option. Force Specialty[+2] - Precognition: What was once dreams and intuitions has become visions and precise certainty. When there are seemingly unfathomable variables at play Zef has a staggering ability to pull a win out of nowhere. Force Drawback[-2] - Conscience: The darker acts that other initiates seem to revel in do not appeal to Zef. He is more than their equal in terms of ambition but he is always hesitant to commit to these shortcuts to power. Sometimes he wonders if he should have just trained with those rogue jedi. Ambition: Honestly all Zef has ever wanted was to live his life and fulfill his craving for adventure and excitement. Getting control of a planet or system would be great if he wanted to kick his heels back in retirement but he knows that he is decades away from wanting to do that. 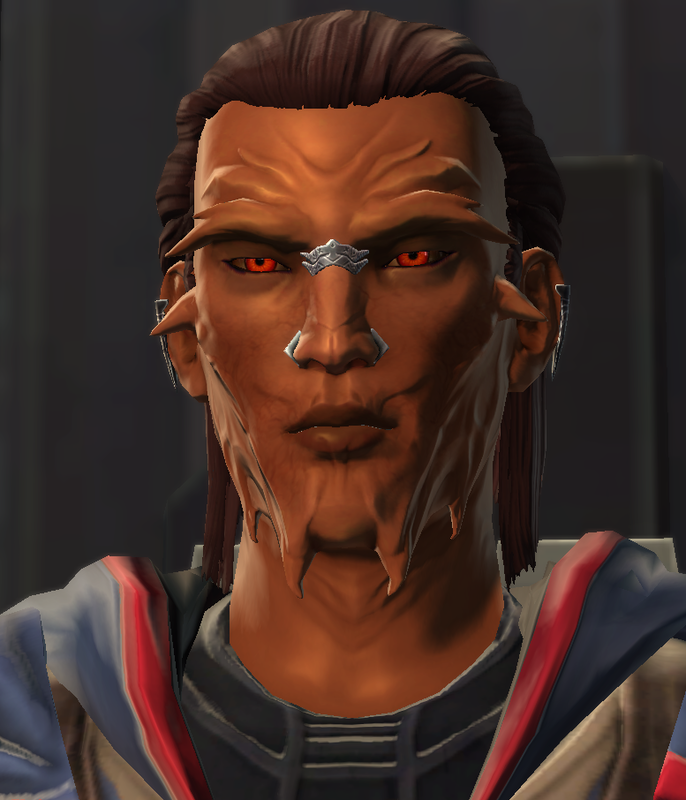 OOC I want to play as a Sith who isn't wholly evil, just ambitious. To see how long that can last. Vor'drosai was moderately shocked when they had handed him a weapon and a basic set of equipment. He toyed with the training saber, turning it on and off, waving it back and forth a bit before the shuttle-ride down (or during, much to the annoyance of other passengers, no doubt), before finally securing it on his back. An actual weapon! Korriban must be a special place, indeed, if he was allowed to hold a weapon. While much on Korriban was new to Vor, the Sith Overseer and his type was all too familiar to Vor. And so Vor adopted the tone he took when speaking to superiors; that of feigned servility with the slightest hint of a sneer. "At once, Master," was all he said. And then he was gone. He wasn't sure exactly where this tomb was, but he suspected that if he followed behind or with the rest of the group of initiates, they would lead him to where he needed to go. He did not answer the one who spoke, eyeing him suspiciously, but he did watch him. As likely a lead as any. Background: As is so common with Twi'leks, Vor'drosai was sold into slavery at a young age. His early life was one of pain, humiliation, and toil as he was sold and re-sold, passed from owner to owner, but in these years Vor did not succumb to despair. Instead he nurtured his hate, fed his anger until it boiled inside him, hidden beneath the surface, spurring him onward. Though physically weak but ideally suited for domestic chores, Vor never found himself staying in one home for very long; improbable accidents seemed to follow him wherever he went, and it wasn't long after being bought that he would be back on the block, sent to market to recoup losses. It was only by chance that a Sith Lord, browsing for a new slave or two of his own, discovered that Vor, much to his surprise and amusement, was Force-sensitive, and that all those “accidents” were no doubt the work of an angry but untrained adept. So it was arranged that the Twi’lek slave be sent to Korriban for training; he would either harness his hatred and anger and don the mantle of Sith and thereby humiliate and anger his peers, or he would die. A win either way as far as his Master was concerned. Force Telekinesis [+2] - Spooky action at a distance. Perhaps as a natural counterbalance to his slight frame, or perhaps his lithe build is a result of his talent, but more than any other discipline, Vor has excelled at using the Force to manipulate the physical world. His strength and control are frightening, and he uses this talent in combat more than any other. Oh, he'll thrown a lightning bolt now and then, but why throw lightning when you can throw a man into orbit instead? Force Physical Enhancement [-2] - Why would you ever bother actually physically fighting someone when you could just crush their throat or torture them to death with lightning? Vor has never seen the point in actually swinging a lightsaber if he could help it (that poo poo looks exhausting), and subsequently never put much effort into learning how to enhance his own body or combat prowess with the Force. Ambition: Recognition. Power. Fear. Vor craves all these things, everything denied to him as a slave. But above all, Vor wishes to be feared, and will do whatever it takes to accomplish this. Zro straightens as she leaves the shuttle. Finally. An eternity spent scuttling about in Guardian posture has left her irritable and she rises to Select bearing with great relish. She knows little about the history of the Sith but already she approves of the sweeping heights of their architecture. Still hideously angular but a step in the right direction. A haughty Sith Overseer interrupts her musings and lays out her first task. What silly hoops she must jump through to better herself. As she turns to leave one of the other Initiates makes a proposal. "I'm not sure what we'll find in that tomb but I'll bet it'll go easier for us if we work together. What do you say?" Zro's head swivels to study the human. "Hmmm yes, you could be useful. Very well. Lead on." Zro's words are accompanied by a purring sensation of pleasure delivered through the Force. It is neither subtle nor coercive. Merely a flick of sensation delivered as one would hand a treat to an eager pet. Off we go. Obviously making friends. Force Specialty: Twisting Minds[+2] - Zro's application of the more persuasive powers of the Force is curiously strong for her level of training and uniquely persistent. Those effected by even the simple mind tricks she is currently capable of are mentally scarred long after the fact, thoughts twisted to whatever belief she instilled. With proper training her mental abilities will be truly fearsome. Force Drawback: Weak Enhancement[-2] - Zro's self image subconsciously rejects her adjustments with the Force, making her enhancing abilities much more feeble than they should be. Ambition: Flesh is weak. The ways of her people preserve the flesh but that is nothing. Empty husks abused by the universe. Zro reaches out and tears into minds. Eventually if she is skilled enough she may be able to carve other minds into copies of herself. Finally she will not be alone. She watched with interest as the bird creature gruffly responded to the woman's pleas and she fell in line behind it. Him? In any case, the card slinging man followed as well. How delightful! She really couldn't have planned it out better herself. Ignoring the other initiate who had trudged off silently on their own, Katara briskly walks until she is alongside the roguish man. "An interesting choice for a first assignment, don't you think? No nonsense, no "go hit this monster with a stick", but the pursuit of knowledge itself." She shivers with delight. "I am afraid I've not caught your name. I am Lady Kat-" she pauses, daintily covers her mouth with one hand and titters. "I suppose that does not matter here. I am Katara Orono." All the while she is staring ahead at the terrified woman. Surely no such person would actually have been brought here to train. So openly fearful, so openly acquiescent? No, more likely a plant to weed out the odd oblivious initiate. Katara briefly imagined the bird creature hurling her against a wall after the inevitable betrayal. She smiled. Just following everyone else for now. Keeping an eye on that woman who was acting all frightened though, to see if she's up to funny business. Not sure if the class quality is for Force only but if it isn't and I need to roll against her being deceptive, using Sith inquisitor [+2]. Background: The Orono Syndicate is a power bloc of low level Sith nobility who have banded together to further their own interests in opposition of the greater powers- mainly the desire to reduce and eventually stamp out the Empire’s Human-above-all agenda. While she never had to want for food or comforts, Katara’s youth was no better than some of the wealthy middle class until she exhibited potential as a Force user. That changed rapidly and accelerated ever further when she displayed potential use of Battle Meditation. Now the prodigal scion of the Orono Syndicate, the sharp witted and independant Katara is being shipped off to the Academy at Korriban with hopes that she will bring power and prestige to the Orono Syndicate. Force Specialty: Battle Meditation [+2] - While by no means experienced enough to be considered a master of such a rare and esoteric Force art, Katara is unmistakably a prodigy. She is able to coordinate, empower, and bolster the moral of her allies while also confusing, terrorizing, and enfeebling her opponents. It is an immensely draining ability however, so she prefers to not be actively involved in said battle if possible. Force Drawback: Lesser Agility [-2] - As her mental acuity and the ability to project herself is above the norm, so her ability to physically move around space is below it. While most Force wielders are capable of acts of unmatched agility (high jumps, flips, all sorts of fun stuff), Katara just can’t seem to summon that sort of power without great effort. Ambition: Like all Sith, Katara desires power. Her particular flavor is power over other people, the ability to impose her will and change society to better fit her idea of “right.” She knows it will be a long and treacherous road, but is confident she has what it takes to sit on the Dark Council, and with the right allies… maybe more. Ah, one of the oldest tricks. Zef remained guarded and focused on the moment: on the path they were traveling and the ones going the same way. He could tell many of the others were already counting their rancors before they hatched and the thoughts came anyway. "Why they would have us go after an artifact instead of a qualified team. I'm not sure most people on the planet could even read them either if they are old Sith." He did not use his precognition actively but his gut still had its opinion. "I've got a bad feeling about this." GM Group 2: Update, Please wait for Valhawk's update before posting to prevent confustion. The scene with the woman resolved itself, her blubbering of thanks to Kolzaar was sickening. She overheard her saying her name, Mavis or something like that. Katara could sense that Mavis would barely qualify as sith. It was laughable. Did Kolzaar take pity on her? Was he too weak? No matter she made her way to the one she overheard the imperials calling Zef. Her introductions made, and keeping a watchful eye on Mavis she and the rest of the loosely aligned group distantly made their way to the tomb. Perfect to be ambu- . The crazed initiates leapt from concealed areas. Their robes were torn and they had many items on their persons that did not belong to them. 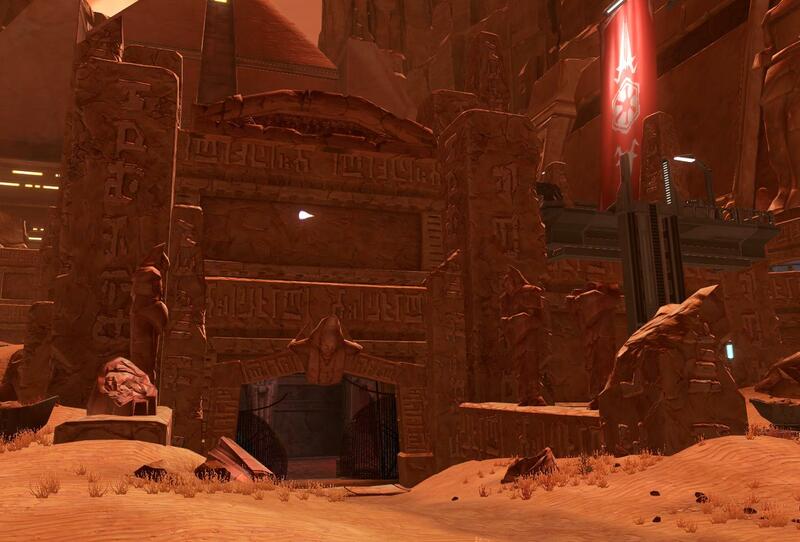 Initiates that failed in their tasks were often heard of eking out an existence in the wilds and tombs of Korriban. 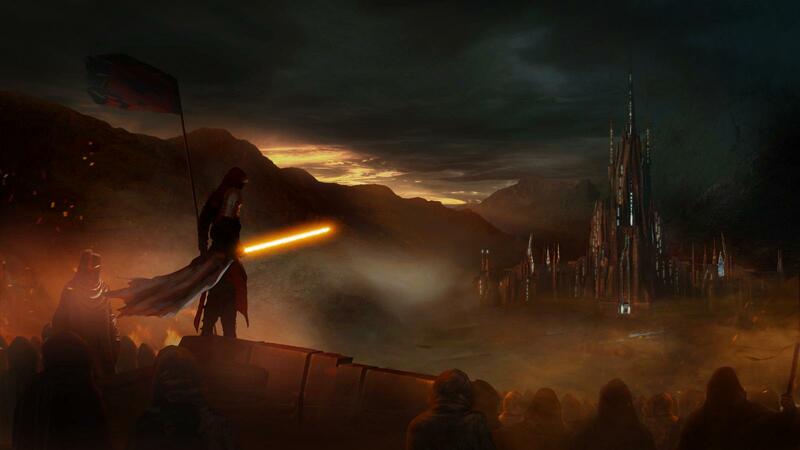 The masters and lords left them, another challenge for initiates aspiring to be sith. With wild eyes, the leader of the dozen or so group pointed an old lightsaber hilt towards Katara and Zef. (The others were too far ahead). "Little sithling, little sith. Give us your stuff and we might let you live." The rest of the motley group had various training weapons, ancient sith blades pitted with rust and misuse, and in one case a large rock. They were oozing dark intentions though it was their own weakness in the darkside that led them to failure. You don't detect Mavis' having a betraying intent. You catch up to Zef and while not allied, are with him when you both get jumped on the way to the tomb. There are about a dozen or so failed initiates demanding you give them your stuff! The woman Kolzaar took under his wing blubbered thankfully and looked in awe of the kindness shown to her when Kolzaar gave her his other remaining weapon. As Zef followed Kolzaar and his follower Mavis at a distance, Zef was soon joined by Katara. There was some distance between the birdman and his newfound friend and Zef and Katara while the sands began picking up in the wind. It was then that Zef's premonition began tingling, the darkside warned him of an impending attack. The grouping appeared out of the sands, Their clothing tattered, equipment ill used, and holding many items not belonging to them. Zef felt that these initiates were failures, weak. But they had the numbers. It was the leader of this troupe that touched his senses. He was the threat. The man held out a looted lightsaber towards Zef and Katara, it was not ignited yet but would be a potent weapon against the training blades that Zef and Katara were carrying. You and Katara are travelling behind the others to the tomb when you are jumped. There are about a dozen failed initiates demanding your supplies and stuff. The leader seems dangerous too your premonition. The woman looked thankfully over Kolzaar's perceived kindness. She picked up the weapon and dried her tears. "I'm Mavis. I wasn't meant for something like this. I'll help you since you helped me." The pair of you set off without an issue. It wasn't long before you both came into sight of the Tomb. Outside lay a wounded imperial soldier from the reclamation service. As you both approached he coughed. "Listen, and listen well. Within the surrounding area outside the tomb there are fierce monsters. The Klor Slugs usually aren't a problem but something has stirred them up. Its as if they are in a frenzy. My team and I were supposed to bring back a few artifact caches for Lord Opulace. I know you are busy initiates, but if you find these caches befor you enter the tomb and bring them here I can reward you with some of these writings of Marka Ragnos our team found inside." Mavis looked at you. This could prevent you even needing to go into the tomb to look. But its could be more or less dangerous. Mavis hopefully asked. "What do you want to do Kolzaar?" You have found an imperial in need of help. He can reward you of course. A few malfunctioning droids had gotten in Bikke's way but otherwise the trip was slightly uneventful. He had gotten here ahead of some of the others, but there must have been more before him as there were corpses everywhere. The darkside was stronger inside than the sands of Korriban outside. Bikke couldn't shake the feeling he was being watched by some entity or force as he made his way inside. Several crates were overturned, and it looked like other attempts had been made to gather artifacts in the past. He would have to look and avoid the beasts and other dangers while he tried to locate the required writings. A mostly uneventful trip, you have entered the tomb. You get the creepy feeling some force or being is watching you. There are signs that others have been chased off or attacked and killed by something. You and the other Initiates split off into varying groups and make your way towards the tomb. 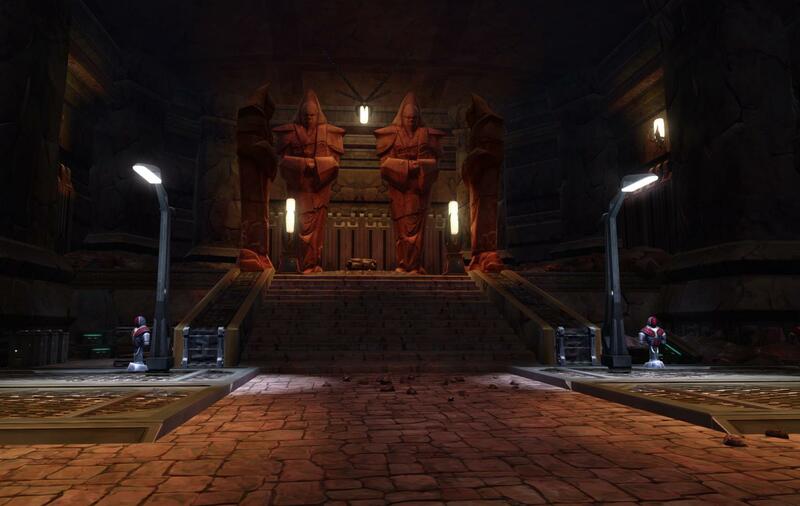 It is not long before you reach the entrance of the great stone edifice, one of many tombs in Valley of the Dark Lords. In the distance, you can make out half a dozen troopers firing into a crowd of the creatures. Zro stares at the writhing mass of blades and teeth, almost but not quite advancing under the withering blaster fire. Fearsome indeed. "These vermin, do they have a queen?" Zro's question is contemplative. She's trying to decide which minds would be more expedient to overcome, the beasts or the troopers. "There is what's known as a Brood-Mother, my lord. It is the primary way they reproduce. Our mission involves its termination, but unfortunately until we receive the reinforcements we've requested we're limited to containing them in the tomb. Based on estimates from Command on their arrival time, we expect to have exterminated them by the end of the week. The captain doesn't make any attempt to block your entrance, he's not so foolish as to try and impede a Sith. Rather it seems he's just warning you about what's going on inside. "We're your reinforcements." Zro lashes out with the Force, propelling the captain's mind over any doubt and inconsistencies. It is an old trick that Zro has learned anew. She waves a hand dismissively. "Prepare your men to advance, warrior. You will hold our flanks." Definitely-not-Jedi Mind Tricking the troopers into guarding us. +2 Mind Twisting and +2 Inquisitor. It wasn't the first time Zef had been accosted by ruffians. There had been times he'd been one of the ruffians. It helped him figure out their mindset quickly. He began to walk nonchalantly toward them. "So you are going to take our stuff and maybe survive a few more days out here." He takes a look out at the bleak landscape before turning back to the wildlings. "Come on now, staying out here is a death sentence. I'll give you one better than what I have on me: My account at the Sith Imperial Bank. It'll be enough credits to get all of you off world and a bit left to get started somewhere else." He put his hand on the hilt of his weapon. "If it isn't me, it will be someone else. Take the offer and save yourselves." Trying to buy my way out of this and save these wretches. Of course I'm playing defensive in case they decide to jump me. Precognition [+2] and Inquisitor [+2] Total +4 should they decide to attack, precog for timing and Inquisitor for basic battle skill. Conscience is more of a roleplay effect here. Bike looks around carefully. All he had read suggested that the ancient Sith tombs were death traps, but this rather neatly confirmed it. Proceeding deeper into the tomb, Bikke opened himself to the Force, letting the dark side energy of the tomb mingle with seething cauldron of emotions within him. He would figure out who or what was watching him, and once it has been taken care of he would find the most impressive artifact of any of the acolytes. He would prove the overseer that he was meant to be here, that he was not to be trifled with. Bikke's gonna keep cautiously exploring the tomb, not taking anything yet. While he does he's going to use Sith Inquisitor[+2] to try sense what's watching him though the force. He wants to get the most impressive thing possible. As Zro Ta performs her trick, Kier decides to move in and assist and advance with her together. "Clearing this will be child's play." He says as he ignites his training weapon and moves in to clear the creatures. Using: Sith Warrior [+2] and moving with Zro Ta (and troopers if they come other wise just the former) to clear the path smartly. Vor listens to the trooper explain the situation, only mildly indifferent to the soldier's problems. He had not been sent here to fool around with either soldiers or slugs, but he nodded to the trooper, at least until the Kaminoan sought to bend him to her will. He rolled his eyes and drew his training blade. This seemed a straightforward problem with a straightforward solution; kill. No need to complicate things with tricks and manipulation. He waded out into the fight, brandishing his blade and seizing whatever he could with the Force to rip, tear, and crush anything that got in his way. He would succeed. He would reach Spindrall. Using Sith Inquisitor [+2] and Force Telekinesis [+2] to start fighting my way through the tomb, ripping bugs and obstacles apart or turning them against the other bugs while slashing at anything close with his blade. Working beside commie's dude though not with him, if that makes sense. "What do you want to do Kolzaar?" Mavis asked innocently, looking down to the wounded and soldier and up to the towering bird. Kolzaar preened his chest feathers for a moment in thought. It was quite a unique opportunity. "If the reclamation service has reclaimed the writings of Marka Ragnos from the crypt, it hardly suits our purposes to go to the crypt looking for them." "I agree!" Mavis exclaimed with excitement and relief. "Let's help out the wounded--"
Before the words were quite out of her mouth, Kolzaar pounced on the injured Imperial. Faster than a creature that size should move Kolzaar bridged the distance, swept a foot under one of the Imperials shoulders and kicked straight into the air. A look of great confusion played across the soldier's face for the split second that he floated at eye level with the massive bird. Kolzaar wasn't watching the face very closely, he merely swept a wing under the Imperial, turning him onto his stomach in the air. And as the soldier began to fall, Kolzaar leaned in and fell on top. The two crashed to the ground with an eruption of dust. The whole maneuver had taken scarcely more than a second and yet, there lay the soldier face down in the dirt pinned professionally beneath Kolzaar's knee. "WHERE ARE THE WRITINGS OF MARKA RAGNOS!!" Kolzaar cawed menacingly. "What are you doing!?" Mavis cried. Kolzaar turned and examined the human coldly, blinking slowly only once. 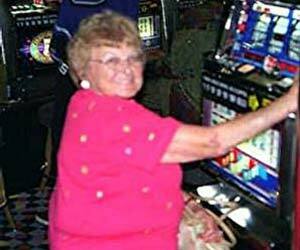 "I worked for many years with Dobo the Hutt, Mavis. Specifically in ... Acquisitons... It is in many ways my field of expertise. And in none of those years did I ever leave my target to kindly go and acquire his groceries." Mavis stared blankly at the gigantic bird as Kolzaar returned his attention and considerable force to the wounded Imperial. Without ever looking back he cawed instructively, "Search him for the writings. Any weapon on his person are yours now." Kolzaar is pinning the wounded Imperial to the ground and demanding the writings of Marka Ragnos. He has instructed Mavis to search the soldier and take any weapons in his possession. If the writing are not on his person, I will be demanding to know where they can be found. Katara pulled her hood back and ran one hand through her hair, the training weapon held at her side in the other. "Oh dear, we've been waylaid by fearsome marauders!" The words ooze from her mouth with performative sarcasm. "My dear, I'm afraid you've forgotten your place. You do know that the only reason rejects and failures such as yourself are allowed to exist is to be a speedbump for the real recruits? The promising ones? Why throw away your life for such a banal reason. In fact, why don't I sweeten my friend's offer? I'll put in a good word for my family if you help us out. You may not have been Sith material, but the Orono Syndicate has need of all sorts of individuals. 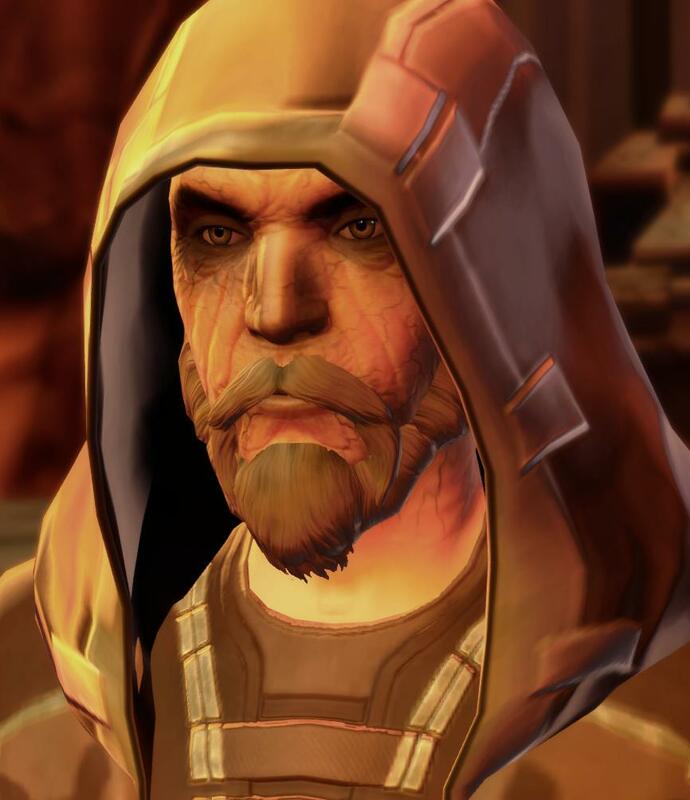 You would have a much more comfortable life robbing debtors than being bludgeoned to death on Korriban, for certain. Of course, it seems like you're the only one worth dealing with here, so you would need to assist us in removing the rest of this dross. What do you say?" While she speaks, Katara falls into the familiar half-trace required to tap into her battle meditation while on the move. Preparing to use Battle Meditation [+2] to help me and Zef out for the fight when it breaks out. For now, I'll concentrate on trying to disorient the enemy to balance the numbers advantage. I'm also going to channel telekinesis as a Sith Inquisitor [+2] and attempt to chuck the large rock at the person next to the rock holder's head. Two ruffians, one stone! Otherwise, fighting defensively. Seeing no other option than to follow the other initiates, Lom draws his sword and thumbs the activation rune. While the others are eager to press ahead, Trajak hangs back. His telekinetic prowess meant that he couldn't be accused of not participating, and he'd also be safe from any surprises that they might come across. Sith Warrior [+2] and Telekinesis [+2] to throw any rubble at the bugs, or my sword in a pinch. The troopers prepare to advance into the tomb in the direction that the source of the K’lor’slug were coming from. Two of your fellow initiates were among their number, demonstrating the fearsome combat prowess of even the lowliest of Sith. Soon the K’lor’slugs in the initial chamber lie dead at your fellows’ feet. However, while the troopers continue to advance, you see that they are not heading deeper into the tomb, but rather what appears to be a side chamber. There is an opening in the creatures attacks that would allow you to slip deeper inside before the beasts could attack again. It might give you an advantage on your fellows, of course it would also means potentially missing out on the glory and prestige that came with resolving the tomb’s monster problem. Continue with the troops, or ditch them in hopes of getting to Spindrall first, it’s up to you. You can see your fellow pupil manipulate the commander, bu there is little time to worry about her schemes as you make your way into the din of battle. Your presence seems to reassure the troopers, especially when you fearlessly wade into the group of creatures already attacking them. The Force flows through you, allowing you to strike with enough power for a single impact of your blade to reduce a K’lor’slug to a bleeding pulp, and enough speed to cut down any of the creatures that approach you before they even get a chance to attack.. You storm through the melee, leaving the ruined remains of the K’lor’slugs wherever you go. 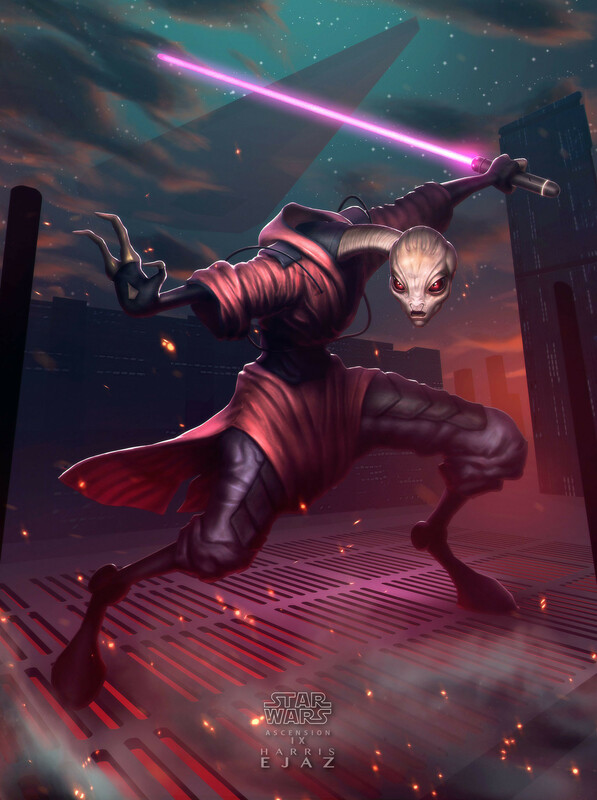 The twi’lek who accompanied your group puts in a decent showing as well, relying more on literally tearing the creatures apart with the force than with his blade though in terms of death dealt you far outshine him. When the fighting stops, K’lor’slug bodies litter the ground, the troops seem to be angling for a side-chamber, away from the path that leads deeper into the tomb. No doubt that is the location of the Broodmother, but it seems highly unlikely that Spindrall who is rumored to be in the deepest portion of the tomb would be in that direction. You make your way into the melee, joined by the scarred human. You could feel the dark side seethe from him as he cuts through the creatures like a vibroknife through foam, a veritable killing machine. You contribute as well, warding off the creatures that get too close with your blade the Force guiding your hand. Your true power though is not in your blade, but rather in the raw power of the Force you unleash into the creatures, invisible blades rip and tear some while others are crushed by invisible fists. Between the two of you with some minor assistance from the troops, the K’lor’slugs in the chamber are quickly slaughtered. While the trooper advance towards one of the side-chambers, no doubt home to the Broodmother their commander had mentioned, that is clearly not the route deeper into the tomb. Your fellow Initiate manipulates the guard while the Twi'lek and the scared criminal advance to into the entrance hall. You hang back, tossing the occasional piece of rubble into the fray, killing the odd K'lor'slug here and there but paling in comparison to the damage dealt by the more actively involved Initiates. Before long the creatures in the entrance chamber have been dealt with. The troopers advance towards what appears to be a side chamber. The route that obviously leads deeper into the tomb lies in another direction. Please wait until Commie posts his update before responding, thanks. A door! and slugs! And they're hungry/angry! As the Battle Meditation flowed over Katara and Zef, the group tensed. They were force sensitive after all. The offer of Zef's cold hard cash made a few of them hesitate but the leader shouted. "Fools! Its a trick, the planet is blockaded! We'd never live to spend it." He ignited the lightsaber and its sickly yellow glow bathed his face in a sinister light. Tiny sparks of lightning played around his hands, but this sorcerer was weak. He raised it and screamed "attack!" A few things happened at this point. Some of the gang paused, not knowing what to do. Two of them ran. The others approached cautiously, the effects of the Battle Meditation giving Zef and Katara a capable look as they advanced as one towards the group. The leader faltered if only for a moment. Hefting his light saber to reassure himself as he strode towards the two of you. Katara threw a small boulder towards one of the rear most, caving in the girl's skull. Zef dodged the clumsy strike of the leader with the skill of someone who was one with the force and knocked the man off balance with a strike from his training weapon to the back. There were 7 of the little gang leftover and they were regaining confidence. The man screamed in rage and two others did the same, gainining power and soon the others charged in towards the two of you. Combat! Some ran, one died, the other 7 including the leader are coming in for the kill. Battle Meditation coupled with Precognition is making Zef very hard to hit. However if Katara continues to watch from the sidelines, Zef might just get hurt. The soldier whimpered. "P-p-p-please. There are some in the case over there." He pointed with a shaking hand. "What are you doing!?" Mavis cried. The answer confused her. She dutiful gathered the scrolls, Kolzaar's pack-mule apparently. Mavis bit her lip and mouthed the words 'I'm sorry' to the fallen imperial. The man groaned but shook his head at the young woman. He knew the ways of the sith. They could be very cruel masters, even to representatives & functionaries of the imperial military. She gathered the scrolls in the case, and a few more just in case they were important. She didn't loot the man though, probably because she feared to do so. Kier saw that his compatriots and the troopers seemed to have everything in hand. The hordes were the problem due to their numbers. The broodmother was a single target for their imperial "horde". His body rippled in pain and suffering. The dark side was close. Spindral was close. Turning from the group Kier went deeper into the tomb, he would either succeed or his existence would end. Either way, he would know. Moving deeper into the tomb. Everything seems fine here. It's fine. We're all fine here. Vor hesitates as the troopers head off toward the side chambers and what is presumably the source of the infestation. As satisfying as finishing that job might be, it is not the job he came here to do. Let the Kaminoan babysit her new pets. They would be her responsibility. After a moment's pause, he heads off to follow Kier's example. Continuing deeper into the tomb to find Spindrall. Bikke took a step back as the creatures approached, but then out of the corner of his eye he spotted a door. drat, it was just his luck to find such tantalizing possibility locked behind barriers. Still, he wasn’t a slave anymore, and if he truly wanted to be Sith, he would have to take what he wanted, drat the consequences. Bikke took all the emotions bubbling up inside of him, the desire to see what lay beyond the door, the rage at impediment the k'lor'slugs represented, the fear of what they might do to him, and he stoked them higher and higher until they seemed ready to burst. Then, the creatures almost upon him, he raised his hands and let loose, channeling the dark power born from those raging emotions, sending arcs of raw force energy streaming out like waves of lightning into the creatures. He would take what was his, he would not be denied, not by some pathetic beasts. He would snuff the life out of them, burn them in raw dark power, make them into pyres lighting the way to his ascent to greatness. Bikke’s going to try and eliminate the slugs in order to get at the door. Sith Inquisitor[+2] to try and blast them with force lightning. Zef took a defensive posture and took a deep breath as he assessed the situation. That lightsaber could be as dangerous to its wielder as it was to those around him if this fool was as unskilled as Zef suspected. Might as well use that to his advantage. Zef concentrated and answered the aggression of his foe with a push of the force intended to throw the leader back into his followers. Let them damage each other. "Are you going to let me have all the fun?" He goaded Katara. Going to go with a nice, simple, and strong Force Push to send these dolts into each other using their numbers against them. Their weapons should harm each other in the tangle and their own anger may cause some infighting even. 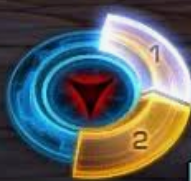 My intent is to use the rules for upshifting/downshifting attack/defense in PDQ(if allowed) to use my precognition for the optimal time, Sith Inquisitor for the ability, and an upshift to really put concentration into it while lowering my concentration on defense. "I wish to see this queen of vermin. Continue, warrior." Zro drops into Guardian posture once more, crouched and swaying. The blade crackles as she gives it a few test swings but it will be a tool of last resort. Zro will lash out with crushing planes of force. She will sweep the gnashing slugs into clumps for the troopers to dispatch with bursts of blaster fire. The trial of Ajunta Pall's tomb had been pretty easy thus far - Lom's fellow initiates had been all too ready to do the heavy lifting. As he watched the group split up, he got the feeling that things were about to change. Still, he knew why he was here. The head of the brood-mother might be just the thing to prove his worth to Spindrall, not to mention the respect of the Sith troopers. He stayed close to the Kaminoan as they entered the side passage. Sticking with Zro Ta and the troopers. Using the same tactic as before, although I'll take a more prominent role now. Sith Warrior [+2] and Telekinesis [+2]. "For a Pazaak enthusiast, you seem to have trouble counting, my dear. I believe "the fun" started when I brained the poor girl with a rock, and that puts me in the lead." Katara gives her training weapon a twirl and steps up beside Zef. She could feel the waves of anger wash over her, coming from the leader of the bandits. Such rage could be one way to power, for sure. But untempered? Uncontrolled? How inelegant. And how easy to use against him. As he charged forward at her, Katara calls on the Force and sends a wave of power out from her, attempting to throw the lightsaber-wielding leader's legs out from under him so she could deliver a heavy blow to his back. Keeping up the Battle Meditation [+2] and continuing to keep the enemy off-balance. 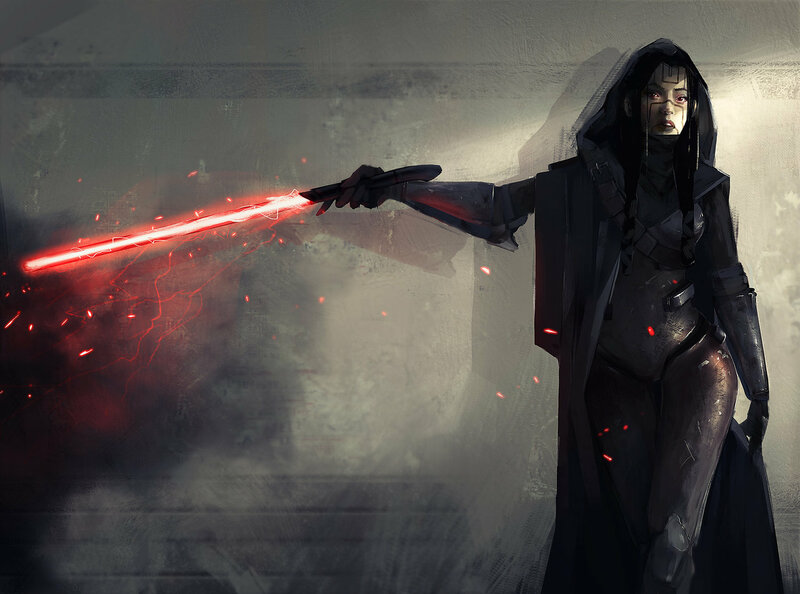 Sith Inquisitor [+2] to force-push the leader's legs and knock him down so I can lay into him with the training weapon. Rising to his full height once again, Kolzaar towered over the Imperial still lying flat on the ground. 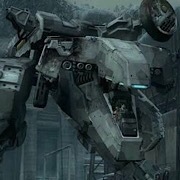 The soldier rolled onto his back and cast a resentful look at the giant bird. Kolzaar preened his chest feathers absent mindedly, looking in the direction of the tomb. "Acquire the writings of Marka Ragnos" he murmured to himself, eyes narrowing on the distant tomb. "... From the Tomb of Marka Ragnos ..." Kolzaar turned his gaze to Mavis and the scrolls she was holding. They were from the Tomb of Marka Ragnos. All the criteria of the challenge had been met. 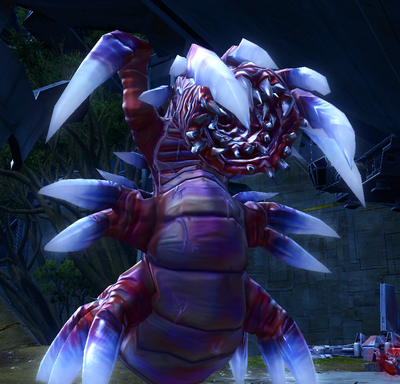 A part of Kolzaar wished for a greater conflict, the opportunity to show his combat prowess. But the mission was over. Entering the tomb with the scrolls he'd already won would be foolhardy. Operatives are selected for the efficiency and discipline, being the first to return with the scrolls would mean more than returning the scrolls covered in the blood of his enemies. The first would show he was reliable and talented, the second that he was prideful and hotheaded. "We head back Mavis." He finally cawed. "Our mission is over." Heading back to find Overseer Talco and give him the scrolls. Update: Players! Do not post until Valhawk has posted his update! Bikke's lightning forced many of the creatures to flee. Others rolled their eye stalks and charged. The lightning wouldn't come! He almost panicked but pushed all of the fear of dying and anger at these creatures into killing them. Suddenly and uncontrollably. The lightning came. Sparks and bolts flew outward white and purple, the darkside cooking the creatures as they shrieked. But the lightning kept coming after they died. It came from his eyes, his hands, and his body. It blasted the stone door and shattered it. Tired, Bikke slumped to the floor, the tiny sparks and bits of static chasing into the stonework. A slow clapping happened behind Bikke. It was the Zabrak. "Nice work. Fool." He kicked Bikke in the side several times. "Don't fear." He said as he smiled. "I won't kill you, against the rules. But the overseer might. Thanks for the scrolls." He laughed as he unsheathed his weapon and made his way into your discovery. It was several moments before Bikke caught his breath. The exertion of the sith technique had unleashed a lightning storm. He could still catch the other rotten apprentice. The rules said no killing. Only if they could prove it. Eh you rolled real bad. But decided to do something cool with a twist with it vs you get maimed by trash mobs. Mavis nodded and followed Kolzaar obediently. Casting one last look at the soldier. The return was uneventful. The overseer stood nearby his desk in his office. "Ah you are back. We will wait for the others before determining who will progress and who will..." he chuckled darkly. "Feed the sithspawn." He looked at Kolzaar and Mavis. "You can ask me a few questions while we wait. If you are so inclined." You made it back. First! You can ask the overseer questions while others will not get the chance! With Katara's battle meditation and the Raw fury of Zef. The underlings fell into each other and many of their injuries took them out of the fight. Many were left unconscious or groaning. The leader slashed with fury but not much finesse. His weapon a greater threat than the man. The blades locked and he snarled into Zef's face before pushing back from him. His strikes were vicious but predictable. With another pass and crossing of swords, Zef struck the leader down. The light saber fizzled out and rolled on the sand between Katara and Zef. The remaining disgraced members of the gang soon began to stir and would awaken to fullness soon. Combat won. Kill your enemies or let them attack you again? Y/N? You leave the Imperials behind and head deeper into the tomb. There are a few more creatures here and there, but you cut down any that might interfere with you with relative ease. You can sense that behind you is another of the Initiates, but you manage to make your way through the tomb to the lower levels more quickly than your competition. In the huge sacrifice chamber in the heart of the Tomb, you find your goal. At the lower level there are a dozen or so Initiates training, while the master awaits at the top. You head off close behind the scarred human, the trials and tribulations of the tomb are not unexpected. However, you make your way through them unscathed, though still behind Kier. When you arrive, you see him already speaking with Spindrall at the top of the chamber. Around you are other Initiates in various types of training, though none you recognize. A few seem to be eyeing you, sizing you up. One in particular, a rather large human steps forward. “Look, fresh meat. Do you think Lord Sprindrall would let me take his place if I kill him?” He draws his blade and starts advancing towards you menacingly. The troops advance hesitantly, especially at the departure of the two Initiates who had most distinguished themselves in the last battle. The side chamber is large, though smaller than the atrium you were leaving, and it is absolutely crawling with K’lor’slugs, against the far wall of the chamber is one of the creatures far larger than the rest, it must be the broodmother the Lieutenant had been sent to dispatch. The troopers set up their lines of attack and open fire. You attempt to assist, but your efforts seem to have limited results, you cannot seem to match the timing of the flow of battle in the same way the troops or your fellow Initiate can. This leaves your attacks separate from the troopers volleys, limiting their effectiveness. You manage to kill a few of the beasts, but your efforts pale in comparison to the kills racked up by your fellow Initiate. After a few grueling minutes, everyone's efforts pay off, and an opening appears in the creatures attacks, there isa route to the broodmother itself. If you can kill it, quick victory will be assured, but it also means leaving the safety of the formation. You have little doubt if you stay with the troopers you will win eventually, but it will be a slow grinding affair, costing both casualties and time, time your fellow Initiates might use to get ahead of you. The battle begins simply enough, the troopers form a firing line and let loose with their blasters. Searing red bolts shot into the horde of slugs, drawing their ire and sending them screaming towards the troopers. They did their duty, continuing to fire even as the creatures beared down on them. Just before they arrive, you move into action. With a flourish, you send half a dozen good sized chunks of debris shooting right into the center of the advancing creatures, breaking their advance for a time. Taking a place at the front, you manage to keep a number of the creatures occupied killing more than a few, and allowing the troopers to continue their work unimpeded. Your fellow Initiate contributes with a blast of force energy now and again, but her efforts do not seem to contribute greatly to the overall battle. Bikke lay there for a few moments, seething, letting his anger build up inside of him. For a minute, he contemplated simply blasting the entrance with lightning, and trying to cause a collapse that would bury the Zebrak forever, but in the end he rejected the idea. He had no idea what mysteries might lie in the chamber, and there would be other ways to make the Zebrak pay for this humiliation. So, Bikke entered into the chamber after the Zebrak, moving forward carefully and quietly, so that when the time came he might get the drop on his rival. Bikke’s gonna head through the door. Trying to keep a low profile to get the drop on his rival. Sith Inquisitor[+2] for spotting traps based on his research on the way here, and general force danger sense. Zef immediately reached out to pull the lightsaber to himself with the force. He looked into Katara's eyes and saw her fury, and realized that he wanted the lightsaber to finish off the fallen. He took a deep breath and began to release his anger, giving up the struggle for the lightsaber. He would not stop her from her grim task, but for himself would not allow the dark side to override his will. Instead he took a moment to center himself and began to search the bodies of the fallen. They had managed to score a lightsaber, what else might they have found? Invoking my drawback to explain losing the contest for the lightsaber. Conscience -2. Looting the bodies and if I have to fight then it'll be at +0. Vor stops short as the human approaches. poo poo. He was bigger. And probably had more practice with a blade than he did. Almost certainly. Fear bubbled up somewhere deep inside of him, and he reached down to grab hold of it. "If," was all he said before he reached out with the force to crush the human's throat. Using Sith Inquisitor +2 and Force Telekinesis +2 to crush this guy.